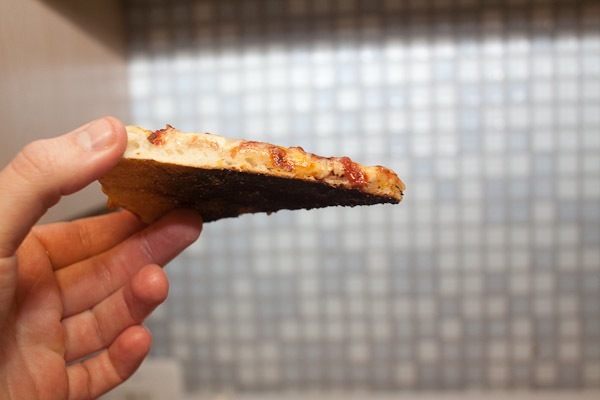 People go to great lengths to try and replicate authentic pizza at home. One of the main things separating the pizza you make from the pizzerias is heat. 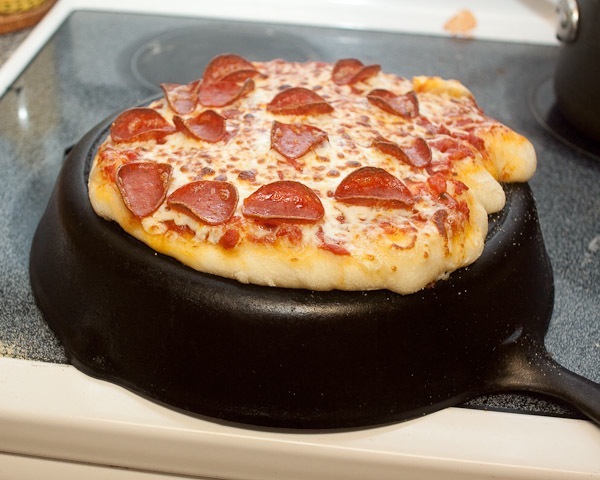 I read about one guy who used the cleaning cycle of his oven to get it really hot and then jerry rigged the latch so he could open it mid-cycle to retrieve the pizza before it turned into a crisp. That is pretty extreme. I also wouldn’t recommend it unless you are well insured and know what you are doing. This concept is slightly less extreme. 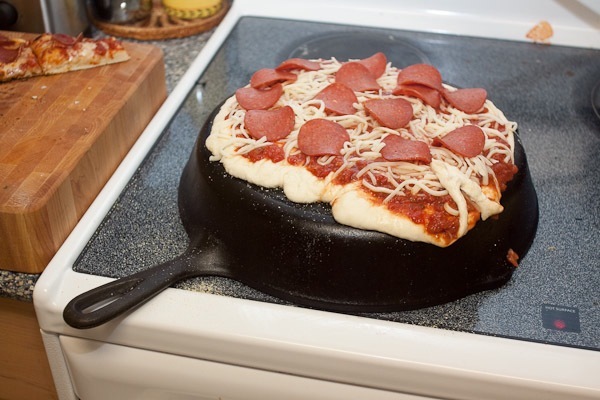 In order to achieve a similar level of heat you heat a cast iron pan on the stove, invert it and then use it like a pizza stone and cook the pizza under the broiler. The intense heat of the broiler, combine with all the hotness stored up in the pan, gives you an environment similar to a real pizza oven. Or at least it is supposed. I found out the hard way that you have to do a good job of rolling out the dough. Mine was a little too thick. I had a nice cooked top, a slightly charred crust and in between that was a doughy mess. It all tasted good, but there is definitely a learning curve. It gets hot in the summer here in DC and we have our AC on for most of the time. One of the real advantages of this technique is that you don’t need to preheat the oven and get a large pizza stone hot. I think it will take a few more tries for me to perfect this method, but if it keeps the kitchen cooler and gives good results, I am game! There is a good write up and some recipes that use this technique in the Atlantic and in Serious Eats. I followed the Serious Eats one when I gave it a try. Hi Darcy, That is a great point. You have to make sure you use an oven-proof pan. Cast Iron pans are a great choice because the pan holds the heat really well, and they are cheap! GREAT IDEA~~ Another idea is to preheat a cast iron dutch oven at about 450-500 for 45 min. 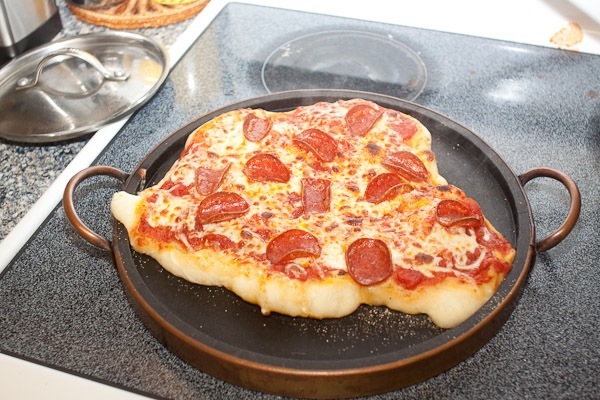 Then, place your pizza inside and replace in the oven for 2 min. It creates a mini-pipin hot oven. I might give that a try for pizza.. It worked AMAzing for a crusty puluese loaf. I mean- replace in oven for 12 min. not 2 ;-) or however long your pizza takes to cook. And so… what is that you are using in the final picture? It doesn’t look like cast iron, but I really want to believe that it is, so that I can buy that gorgeous pan from Lodge and get cracking! It is a pizza pan I got that is made out of soapstone. I never thought to heat it on the stove though so it would get extra hot.